Know who's coming in and who's taking time off. Still relying on spreadsheets to manage your team's leave information? Give your leave tracking process a digital touch. This application helps you process requests for time off, view monthly employee records, and more. Use it as a standalone app, or as part of a human resource management system. Keep up with your team's attendance. Streamline your leave approval process. All employee requests for days off are automatically routed to their managers for approval. The manager can either accept or reject with a single click. Customize leave types and holiday list. Define different leave types (casual, sick, on duty) and color code them based on employee roles, type, etc. You can also create and publish holiday lists based on, for example, geographical location and time zones. Year-end leave processing shouldn't mean extra work. Automatically compute leave lapses, carry-forwards, and encashments for employees, according to your organization's time-off policy. 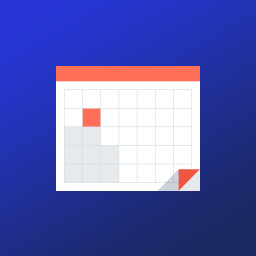 Easily track your team's leave info and history of days off with dedicated reports. Both you and your employees will know how many vacation days are left and how many can be carried forward. Let employees apply for days off, directly online. 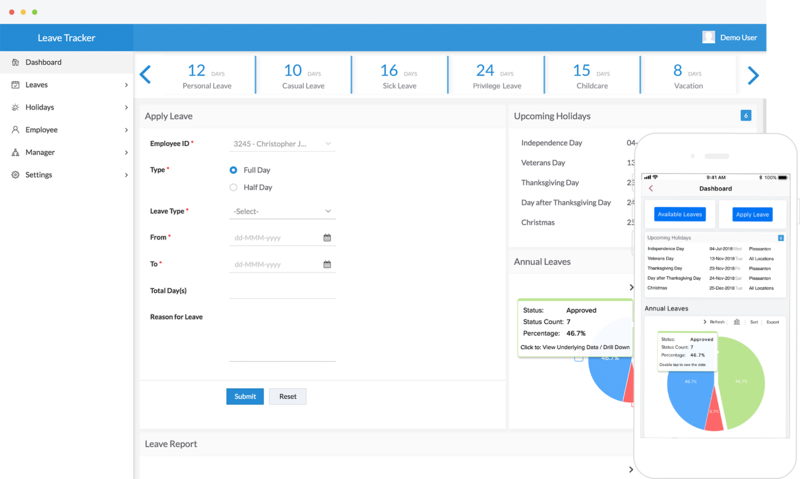 They can also view upcoming holidays, check their monthly leave report, and other time-off related information from a master dashboard. Rethink customization with Zoho Creator. 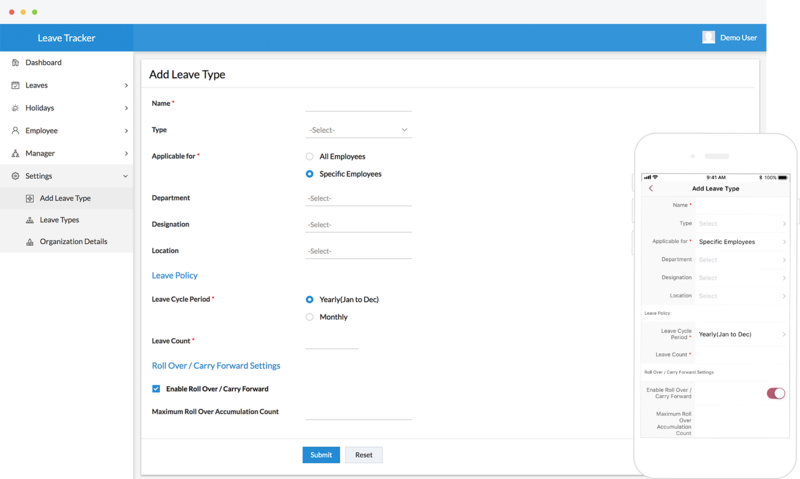 This leave tracker application is powered by Deluge—a low-code scripting language that uses logic to help you automate workflows. Need to include a new feature, or alter an existing one? Just drag and drop fields from our intuitive builder and add a few lines of code. Stay connected to your business, no matter where you are. With Zoho Creator, the apps you build or install are automatically available on iOS and Android devices. 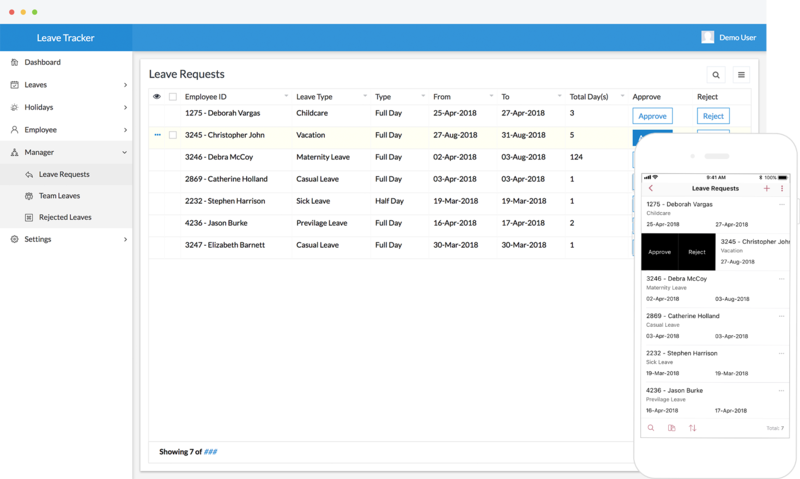 View requests for days off and approve or reject them on the go. Break down data silos with integrations. Apps built on Zoho Creator are tightly integrated with other Zoho products—like Books, CRM, and SalesIQ—to cover all your auxiliary needs. You can use Zapier to easily integrate this app with your existing software, or with third-party apps like PayPal and G Suite.